“As you know, I already warned the noble courts in response to a petition signed by more than 1,000 of their colleagues. A petition on the initiative of the Dutch Association for the Judiciary (NVvR). They want to support their American colleagues in this way. According to the NVvR, the decisions of the last freemasons’ trump Donald Trump would undermine the rule of law. Rosa Jansen, chairman of this NVvR, says that the petition is not directed against Trump’s political ideas or opinions, but against his statements, which damage trust in judges and thus the rule of law. She realises that the initiative is “a drop in the ocean”. In any case, the American Association of Judges is pleased with its initiative. The American association thanks you all, who sign this petition, very much for your concern through Rosa, since Trump mocked the American judges as “so-called judges”, after a court had overturned Trump’s entry ban for residents from seven Muslim countries. Of course, we can all have different opinions about the true intentions of this Donald Trump, and I would like to respect those of Rosa Jansen, even if they differ from mine, but I do have a few questions, which she must certainly be able to answer. Whether it is because of intention, blindness and misplaced complacency or only because of a lack of knowledge of national history and thus awareness of reality, do not forget that stupidity is also an option. It is better, in consultation with the NVvR, to make sure that together we make the Dutch aware, help the still so many ignorant to gain insight, and the reason why this is better, before the population takes control, I will make it clear to you below. The aversion to the injustice that you all speak is growing by the day and encourages anarchy, in which the guillotine could be taken out of the fat. 1. First of all, I find it strange that the noble courts want to interfere in politics; this does not, it seems to me, belong to their function, at least not in a democratic constitutional state. 2. Moreover, I have the (criminal) suspicion that those noble courts are guilty of the same offence, that you blame Trump,. 3. In this way the Dutch judiciary is part of a political agenda, and this, while Piet Hein Donner, with articles 60 and 120, has forbidden the noble courts to test laws and has therefore sidelined them. 4. 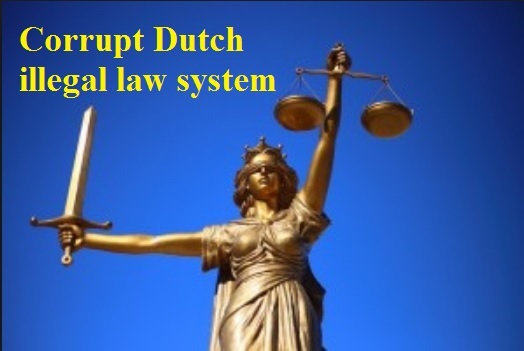 The Netherlands lacks a constitutional court that tests laws and guards independent jurisprudence, which amounts to one-sided jurisprudence and arbitrariness of the political colour of the noble judge as one of the 2,400 judges who signed the petition. 5. All noble courts pronounce justice in the name of the king. You know, William Von Amsberg, who claimed the inheritance of the kingship, even though it has long been widely proven that he cannot be an heir, not of Orange, not of Orange Nassau or descendant of the Romanov family. 6. Not only biological in terms of DNA, but also constitutional. At the end of 1939 his royal waning family already planned to flee the Netherlands. And that plan was actually executed on 13 May 1940. According to article 21 of the constitution, which was valid until then, it was certain that the seat of government could never be moved outside the kingdom, and if this did happen, the kingdom and the kingdom would lapse. 7. And as if not bad enough, that since then the Netherlands does not exist, the Netherlands became a province of Germany on May 18, 1940 and this Netherlands has since been governed under Nazi regime, because all post-war governments of his royal waning family are to this day a continuation of Hitler’s cabinet. 8. Since then, the Dutch population has been lied to and deceived by an illegitimate government and royal house. The whole of Nazi laboratories (parliament) has given his royal waning family the opportunity to deliver the non-legal head of state. An illegal head of state, a criminal, who after the Second World War appointed an emergency cabinet without this cabinet being democratically elected under the direction of Arthur Seyss Inquart. 9. The illegality of the state of the Netherlands means that all subsequent cabinets are not legally valid if we assume a valid constitution, which was in force until 13 May 1940. 10. These cabinets have governed the Netherlands illegally since 5 May 1945. Cabinets, which continued the emergency cabinet mentioned above. A continuation of Hitler’s cabinet in the Netherlands, even though I realise that this sounds absurd, it comes down to that. 11. This observation shows that all international agreements and changes in the law made after 13 May 1940 are not legally valid. Legal cases after 13 May 1940 will have to be dealt with again, not by the noble courts of your association, but by judges, who are independent and judge for everyone instead of for the royal head of state and the clique of traitors around him. So it seems to me and with me a growing number of Dutch people. Or should I still call them Germans? 12. The fact that the EU has been forced upon us as a population on the basis of non-valid laws and by representatives of the people, who actually turn out to be traitors, will have to be tested again under application of the valid constitution of the Batavian Republic. A constitution that can help make the Dutch constitution legal and leading again. 13. This constitutional review is a great opportunity to completely reform the Dutch judiciary and to exclude politics, in which the NVvR wants to interfere, from transparent and jurisdiction. Fair jurisprudence is based on a people’s tribunal, in which a jury from the population speaks justice. A jury that protects us from arbitrariness and abuse, from the criminal interplay of the prosecutors (on behalf of the Public Prosecution Service) and the noble courts as judges. 14. That this combination is criminal and can be concluded as a crime against the population, is evident from the injustice that the illegitimate justice has committed in the name of a non-legitimate head of state and that this Bilderbergsekte, a crime group that actually rules the Netherlands, systematically and systematically deprives us citizens of this country of our rights and efforts after May 13, 1940 and until now, at the expense of the population. 15. It would be to your association’s credit if you did everything in your power to correct this error and, according to the philosophy of Article 140 of the Criminal Code, prosecuted those responsible using Article 162 of the Code of Criminal Procedure, by all members of your association who acted in good faith, but were themselves misled by even forgery of history; ignoring real history cannot become an excuse (“I did not know this”) for what you and your predecessors decided on false assumptions in the past. You know this at least now. 16. All of you, including those of you, who knowingly wish to perpetuate this injustice, are therefore guilty of deliberately committing deception, deception and abuse of power, with the result that the judiciary has lost its legal authority and certainly no longer has any authority at all. 17. Because of the unlawful conduct, the last elections to the Lower House of Parliament on 15 March 2017 are once again not legally valid, the unjust trial and forgery of history, to the detriment of the population, have subtly helped to deprive the State of the Netherlands and our Dutch people of their right to exist. Parliamentary elections incestiously put together the parliament. The members of this parliament appointed from their midst an illegal national government, which has allowed the Dutch to work for the government for 90% of their time free of charge in order to artificially maintain this unlawful politics and jurisprudence. 18. On behalf of a growing number of Dutch people who realise that they do not lend themselves to this as free people, I would like to ask you, if necessary, for assistance in dissolving an association forbidden by their own law, which is called the States General, and in organising a referendum, by binding referendum, on the question of how the population of this country wishes to organise its own national government and the rule of law in the future. 19. I would also immediately sum up to the EC that it informs the EP why EU membership has not been established in a legally valid manner, so that we Dutch people consider economic cooperation between sovereign independent countries of Europe, the question of what a common policy after this binding referendum will look like. 20. I would also ask you to take into consideration the fact that, by means of a binding referendum, all legally required pension savings will have to be nationalised again, because the current government has given 1,400 billion to the traitors union. Necessary to pay off the national debt, which is not our fault. This referendum will also introduce the right to create money and reintroduce one’s own currency, which is again reserved for the population. To regain sovereignty and preserve cultural identity, innovation at home and employment, for which part of this amount can be used. 21. The new currency is sovereign if it belongs to the population, because the right to create money is reserved for it, in order to hinder the centuries-long influence of the interests that focus on money in the future. 22. It would be to the credit of the president of your association if you were to order that all deaf persons should open up, thereby exposing the crimes of abuse of power, party politics, paedophilia and oppression of the own population. 23. If you still think that you can ignore my request, you will automatically be considered a member of the traitor clique around Willem Von Amsberg, a criminal organisation, with the expected prosecution for intentional participation in this criminal organisation. 24. This is not only a national scandal that is taking place here, but the yellow world is being hindered by the criminal globalists and their neo-liberalism and kleptocracy, of which the population has suffered. 25. The law that has come into force, which stipulates that children under the age of 16 are outlawed in order to carry out medical experiments, must be reversed: we cannot allow this doctor Mixing policy on behalf of our children and their grandchildren. We will also prosecute ministers, who have introduced this on false grounds, and have them brought before and tried by a non-partisan court in connection with their complicity in the attack on humanity. 26. Media lies and propaganda commissioned by the political crime cartel about a recovering economy and about less crime to show how well Rutte performed are not a fair reflection of reality; the media should again independently inform the population on the basis of their own research without this being politically coloured. The judiciary is expected to recommend this. 27. This also includes ordering the ban on trading in Wolmanzouten, a waste product from a subsidiary of Shell. This waste product contains Arseen and Chrome 6, but banks and pension funds trade under the denominator of sustainability, using the savings of the Dutch population. 28. The judiciary has ruled that weather manipulation will be prohibited worldwide, to immediately order the Dutch Air Force to protect the Dutch airspace. Protection against the deliberate spraying of toxic substances from the factories of Willem-Alexander Von Amsberg via chematrails. Poison, which, unlike condensation, has almost completely melted away the glaciers and put drinking water at risk by deliberately turning the steel current around the earth. 29. The debt crisis is to distract and oppress the population by the politically deliberate and misleadingly committed with deliberate deliberate thought and with the help of and own actions by the judiciary and established, which means, that the established order has lost all credibility and the confidence of the population has been totally lost, nothing but a crisis of the lost confidence in the national government, hence my appeal to you to help restore this loss of confidence. 30. When the noble courts realize this, they understand that they have to depose a non-legal king and drug baron, who is only called Willem-Alexander Von Amsberg. The network around KPMG justifies that they have ordered an investigation into the Kunduz Agreement’s non-legal decision, so that you can help uncover the abuses and even the involvement of this Willem-Alexander in drugs and money laundering. The Dutch police also receive this message. Happy New Year! With GESARA, this injustice will have to be remedied.